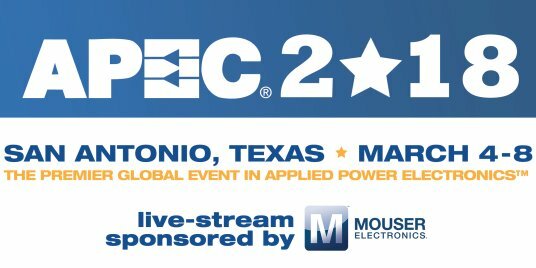 The Applied Power Electronics Conference (APEC) is the premiere global event in applied power electronics, bringing industry and academia together for 28 years. In 2018, IEEE.tv streamed the APEC Plenary Session live for the first time. The Plenary Session was designed to cover the history of power, the current needs in energy efficiency, and future possibilities. Below you will find those speeches, as well as additional content from APEC 2018. Adam L. Hamilton, President and CEO of Southwest Research Institute, presents his keynote talk on the relationship of power and applied technologies. Hamilton uses various use cases, including deep sea science, autonomous vehicles, Cyclone Global Navigation Satellite System (CYGNSS), initiatives in deep space and more. Dr. Johann W. Kolar, Professor at ETH Zurich Institute PES, shares his keynote presentation on the Vienna Rectifier, including a brief history, comparative evaluations and further improvements on the technology. Zoya Popovic, Professor at the University of Colorado, Boulder, reviews types of wireless power transfer in her keynote presentation on low-power harvesting. Prof. Popovic considers examples and use case environments that are practical for power harvesting in certain applications. Dr. Hans Stork, Senior VP and CTO of ON Semiconductor, shares his keynote on systems benefits of high efficiency and the drivers of power conversion technology. Dr. Stork reviews various examples to consider the factors required for achieving full system optimization.